Books — Jeff Katzman, M.D. 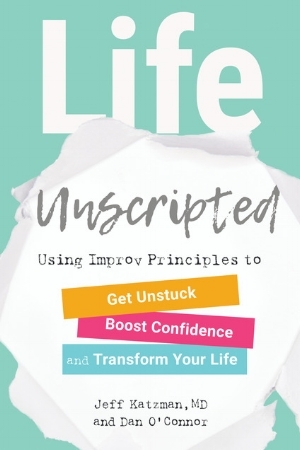 In Life Unscripted, Jeff joins his lifelong improvisation teacher, Dan O’Connor; together they share the secrets of living in spontaneous moments. They help the reader identify the stories we tell ourselves about who we are, the stories that limit growth and self-discovery. They help us to unscript these stories and embrace other ways of being, and learn to operate outside of our comfort zones and traditional patterns of interactions. In doing so the reader taps into the sense of play and connection that we all desire. We learn to turn down the judge that limits our experience and leads to isolation. We take a journey towards community, connection, and the world around us. Life Unscripted will be available September 11, 2018. Find Life Unscripted at Powell's. Find Life Unscripted at Amazon. Jeff Katzman's 2012 novel is a compelling, moving story about the healing power of story-telling itself. Through this work, he demonstrates the process of unscripting through a fictional tale. Martin has shut himself off from life. Too many people he loved have left him: his wife, his mother, his father, his best friend. Once a fearless adventurer and world traveler, he now shuffles through life, working a mind-numbing federal job, raising his two children on his own. A severe accident threatens what little life Martin has left. To calm his young children Martin weaves a story of a distant land from the fibres of his own being. His next-door neighbor, Jane, joins in the story-telling, and ritual narrative gradually brings her into the family. Martin's own story unfolds, and the tale he tells his children creates a new energy, a new life, leads them all to imagine a new future. Find The Storymaker at Powell's. Find The Storymaker at Amazon.